Digital agents offer various possibilities to increase the performance of a customer contact centre (hereinafter CCC). Advantages can be achieved in the efficiency and effectiveness of the CCC process. Using this artificial intelligence (AI) technology, customers can be seamlessly provided with the right information at the right time based on self-service and digital agents. Some might think companies are taking the easy way out by creating self-service solutions that allow them to reduce their overhead by employing fewer support centre employees. The opposite is true. Companies are investing time and money to create a better customer experience by supporting their CCC employees to handle complex issues, with relevant information. Let’s dive into the world of digital agents, and how this AI technology can improve the KPI’s for the CCC process. Virtual employee: as a virtual employee, bots take over simple tasks from service employees or the web care team. Bots, for example, receive first-line customer contact and can answer easy FAQ questions. 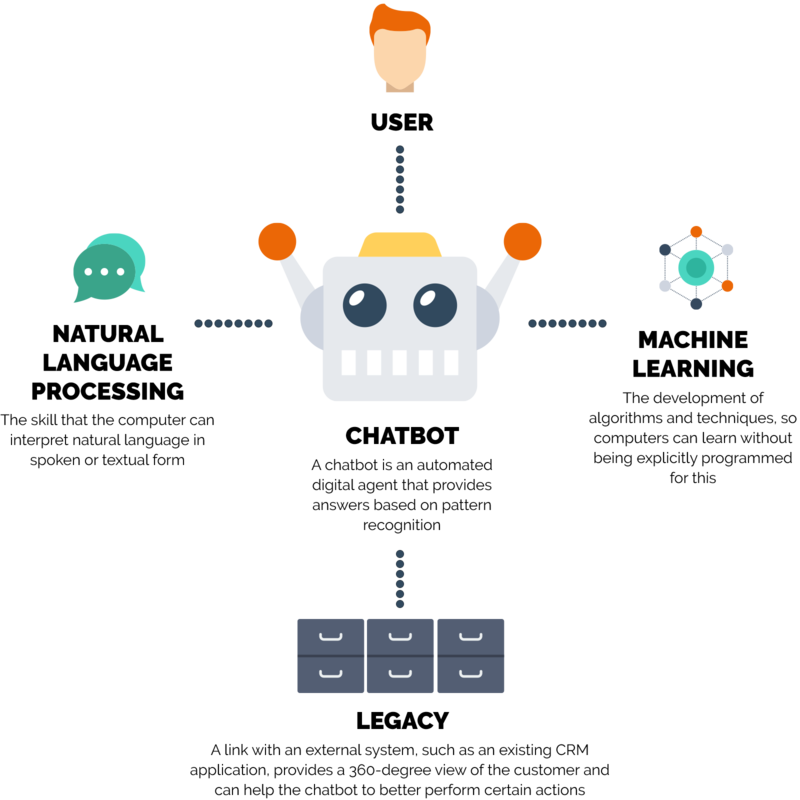 Support: To support a service agent, a chatbot makes suggestions for answers based on business rules data or historical information of the customer. Service agents then only have to approve or reject this answer. Work planner As a work planner, the chatbot already requests the necessary information, such as an e-mail address and/or a customer number, and prepares this information. This way the agent can pick up the work more efficiently. The components stand alone, are often offered separately and could be used separately from each other. In practice, however, an NLP will always be required for a chatbot. They can be further linked to the existing legacy, such as an existing CRM application. The chatbot is the central control for the digitized CCC. It steers the customer interaction process through intelligent digital dialogues using both natural language processing and machine learning. How do you know if your customer service is living up to your customer expectations? The answer lies in KPI’s, or key performance indicators. There are plenty of different KPI’s you can use to measure customer service and the success of your business’s customer service strategy. Different ones will make more sense for different types of businesses. Below is a list of different KPI’s your business might consider using to measure customer service. 24/7: increased availability, dynamic capacity (“a chatbot never goes to sleep”). Predictive capability service demand: the customer’s demand is already known before he calls, which makes proactive action possible and reduces the call volume. Predictive capability customer buying : prediction of customer needs, purchase behaviour and churn. Personalization: personal / customer orientation through customer intelligence. The AI platform recognizes the customer and is familiar with things such as his purchased products, current orders, payment behaviour and contact history. The AI platform is also able to analyze and anticipate its emotional mood during the call. Smarter customer interaction: Targeted problem analysis and effective solutions through broader or faster access to knowledge and experience.The AI platform is capable of analyzing large volumes of interaction data and translating them into knowledge and experience. This also contributes to a more targeted faster interaction (request) with the customer. Basically, AI technology decreases waiting/handling times and increases the availability and quality of service for the customer. Overall, AI will improve the price/performance ratio of the CCC. Should I use AI in my customer service center? Companies that have a customer service centre and want to work more efficiently or improve their customer satisfaction should definitely consider using digital agents in their business. Start with a small use case, like answering your FAQ via a bot. This way, you can easily monitor the success rate of the digital agents. Another application is to have chatbots perform routine work. The chatbot is less visible to the customer but can take over a lot of unambiguous work at the back, which can make the service process considerably more efficient. An example is recognizing the customer’s intent to automatically route messages. Because the chatbot knows which employee is logged in and which employee is the right person to answer the question, the chatbot can prepare the work well in advance by assigning the messages to the right person. For the sake of scalability, we often find AI technology in the cloud. An example of this is the Microsoft Azure stack. This stack offers the 3 AI components (as presented before) modular based on “pay-as-you-use”. This means that AI is no longer restricted to the larger segment, but has also become accessible to small and medium-sized businesses. The AI tooling in the cloud also enables you to quickly and without larger investments get involved into a proof of value (PoV) so the added value of AI for the KCC can be experienced in an initial pilot in less than a month. In my next blog, I will outline the technology behind AI for CCC in more detail. 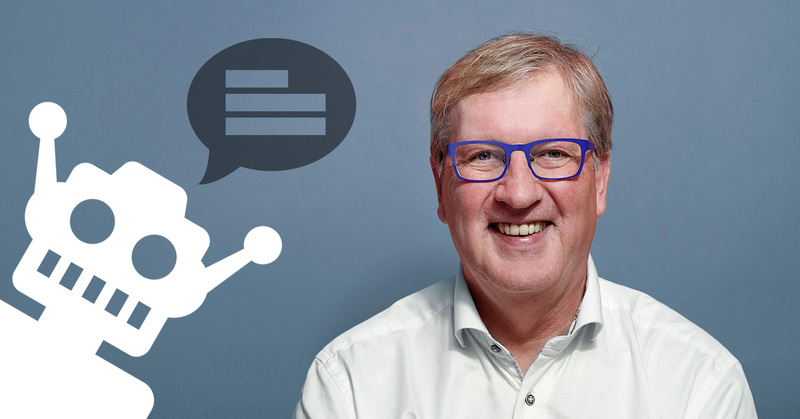 For more information this topic, feel free to contact me via email (jan.stegink@mediaan.com) or connect me on Linkedin.